As plant identification can be challenging for the everyday person, educational nature spaces can be often difficult to navigate. Inspired by the Pacific Northwest's native plants, I created a set of way-finding icons for the local Washington Park Arboretum designed in collaboration with Jen Vuong, Theresa Utanto, Esther Kim, and Wei Li. This project was overseen by Karen Cheng in DES214: Marks + Symbols (print, 16in x 24in). 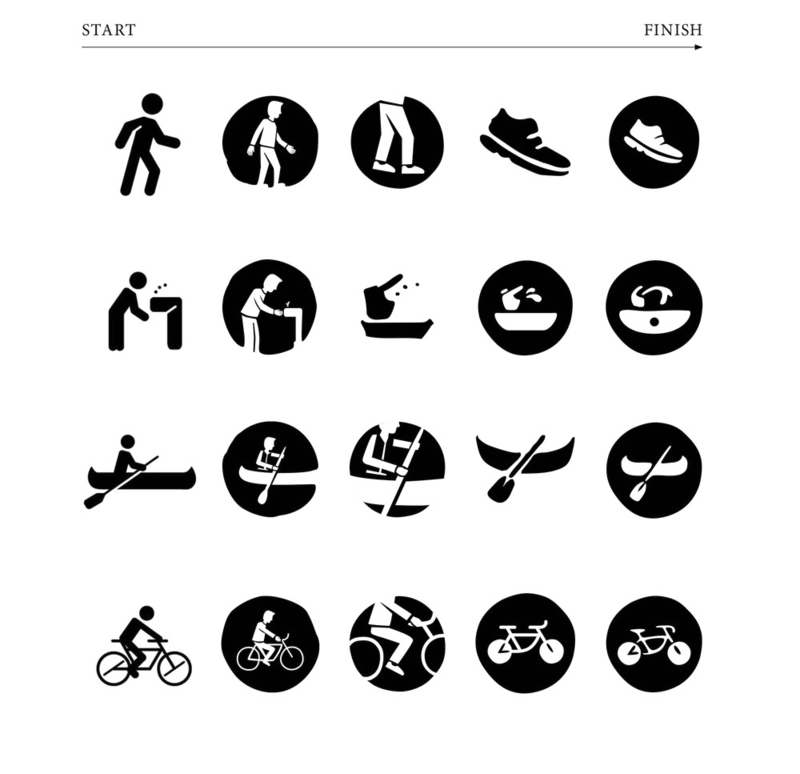 I was tasked with designing the amenities icons: walking path, drinking fountain, canoe landing, and bike path. These iterations began with geometric figures, to more complex forms, to simpler organic shapes. Additionally, I was tasked with designing the final poster displaying the symbols, shown above. 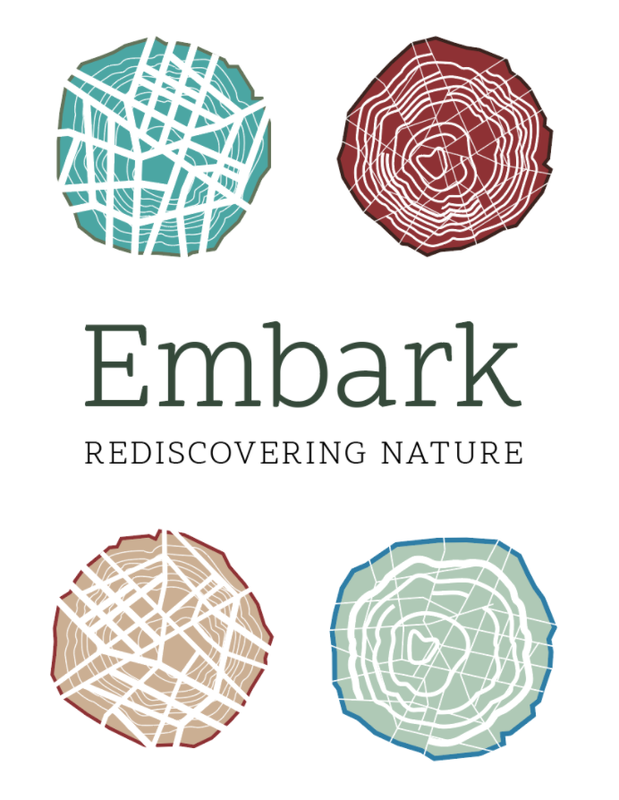 Given the task of programming and designing a conference inspired by the theme of wood, I created a fictional conference titled Embark!. This three-day international conference welcomes students, educators, and outdoor enthusiasts to Estes Park, Colorado to participate and learn about outdoor education. In considering wood as a material, I focused on three conference concepts: 1) outdoor education, 2) wooden play structures, and 3) how wood is used in entertainment (set design, props, etc). I decided to focus on outdoor education because of the opportunity to learn about alternative education. The word "Embark" symbolizes growth and starting a journey, and I wanted to convey that in this adventurous conference. After researching national parks and popular conference locations, I landed on Estes Park, Colorado, which combines natural scenery with a Conference Center. I appreciated the "Green Initiatives" that allow event planners to promote sustainable practices. The interplay of urban and outdoor imagery led me to three visual directions. I wanted to capture wood details and trunk cross sections and bark textures. After this exploration, I developed the third concept further by incorporating the topographic map as a visual motif. Based on guest hierarchy, from attendee to sponsor, each badge features vegetation that would be found at different elevations at Rocky Mountain National Park, where Estes Park is located. The downtown branch of the Seattle Public Library is an architectural, historical, and social icon. 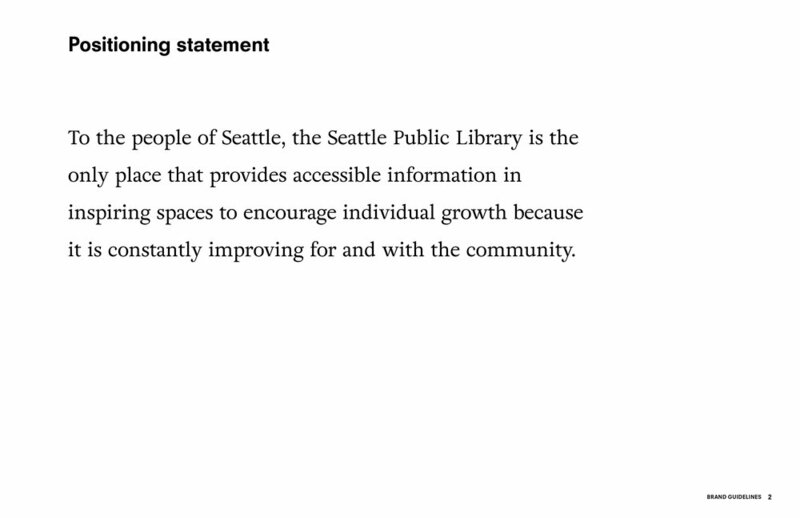 However, the current brand and visual system of the Seattle Public Library system itself does not unite this location to the other 26 local branches. 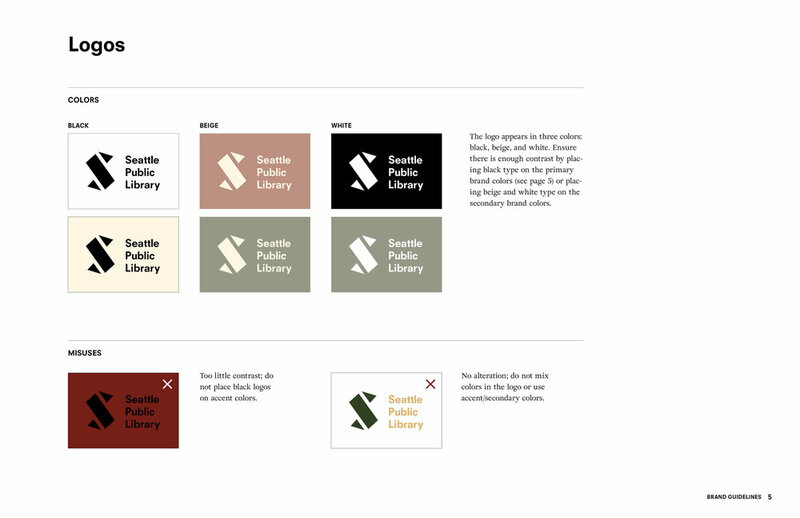 In order to unify the diverse spaces and functions of Seattle's libraries, I opted to create a more accessible, individual-focused brand. The folder and envelope interior feature inverted versions of the logo mark, creating an interlocking pattern. The handwritten type references handwritten elements often found in library books. Each poster illuminates a different function of the library by featuring children, career builders, and adults. The website is a visually modern update to the current site, with cleaner navigation and large hero imagery. I used academic and personal imagery to convey the individual pursuit of knowledge. I wanted to focus on the more nostalgic, analog part of libraries, such as paper textures and notes in margins. Inspired by dog-eared pages and the idea of folding a shape from one piece of paper, the mark also calls to the geometry of the iconic Downtown Seattle branch architecture. Trailforks is a platform for riding associations to keep track of trail conditions, builders to log work & riders to share and plan their rides. The Trailforks mobile app is extremely utilitarian. It has a steep learning curve and is difficult to understand for non-mountain bikers, such as myself. In collaboration with Coreen Callister, Monica Niehaus, and Jen Strong, we aimed to simplify the Trailforks app by focusing on trail location/discovery and sharing the experience. Screenshots of Trailforks interface as of January 27, 2017. To understand how outdoor apps and review services function, we examined Strava, Washington Trails Association, AllTrails, Mountain Bike Project, and Airbnb. To understand how new users would use the app, we interviewed Rick, an active outdoorsman, and Caitlin, a casual hiker. I was responsible for the design of the trail info screens and settings screen, along with animating two microinteractions. The trail info screen incorporates a fixed tool bar at the bottom for quick access of potential tasks. Aligning with our focus on personalization, I opted to make the ‘Donate’ feature more visible, as donations go to associations that maintain the trails. The main feature of the settings screen is emergency information. It displays map location, coordinates, and a ‘Call 911’ button, providing the information necessary in the event of an emergency. The microinteractions I animated include movement of the elevation chart and a payment processing animation. The segmented control allows for an overview and the selected trail’s elevation. The animation shows how users can ‘scrub’ the graph to see how the elevation changes as the distance changes. Calendars are personally difficult products for me to invest in. The grid space is too small to write every event, the monthly photo or illustration is not always desirable, or they simply fall to the floor unnoticed, because they're forgettable. This set of 3 calendars is designed to challenge that, so I opted to create visually dynamic, informative, and attention-grabbing calendars. The result conveys a mood for each month, using only type, lines, and color to do so. This exercise was completed for DES376: Advanced Typography (print, 11in x 18in). Because calendars are traditionally 2-dimensional, I wanted to challenge that format without changing the print medium, which resulted in an isometric solution. To make each calendar unique, yet cohesive, I opted to treat the shadows differently and vary the weight of the type. Ultimately, I defined my only constraints as the typeface (Source Sans Pro) and the angle of the letterforms.